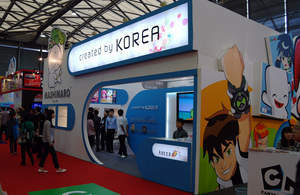 SHANGHAI, CHINA--(Marketwire - October 20, 2010) - Korean characters succeeded in receiving favorable comments from buyers and participants with excellent design and stable Story at the 'Shanghai Licensing Pavilion' held from October 12 to 14. The characters introduced at the Korean common hall included characters already popular in foreign markets or local markets, characters with unique design or Story, etc, and successive conferences were held with buyers throughout the ceremony. The representative characters introduced at this exhibition included MASHIMARO, BACKKOM, CELTA, Marine Blues, MONK, iLoveEgg, Rabbo, POONGPOONG, Puni Culi, etc, and MASHIMARO BACKKOM are receiving steady popularity in the China market. MASHIMARO is a rabbit character of a cute and grotesque characteristic, a representative Korean character with around 2000 hundred million sales of related products per year. BACKKOM consists of episodes that the big sized BACKKOM goes through with his visit to the city from his original hometown, the North Pole, and is being exported to 20 countries, firming its stance as a TV short animation series. CELTA is a Hand Made character with more than 10,000 illust images, but each are unique with their hand printed nature. Marine Blues is a piece that described sea creatures in humane forms wittingly, a diary web cartoon where the main character, comparing himself to a sea urchin, calls himself sir urchin, and compares those around him to various sea animals as well, naming them sir starfish, sir webfoot octopus, sir sea turtle, etc, unfolding everyday lives together. iLoveEgg is a piece where the creative and lively egg shaped character transforms in various forms in simple and natural manners, adding broad imagination and fun to the piece. POONGPOONG is a character whose hobby is to emit gas, and solves every matter by emitting gas. It is an educational play & learn program for children, and aims at comprehensive development of children in areas of emotion, intelligence, creativeness, etc, by showing various activities related to life, emotion, intellectual areas, etc. Most of the introduced characters withhold designs to fit the global culture and stories that can be accepted globally regardless of the viewer's nationality, which leads to the buyers' assertions that one could produce animations to suit each regional countries, make a for-theaters animation, commercialize the animation further, etc, not limiting it only to the Chinese market. Meanwhile, this year's licensing pavilion held at the Shanghai News International Expo Center is a ceremony formally sponsored by the biggest international licensing industry association in the world, LIMA (International Licensing Industry Merchandisers' Association), and is fixing itself as the representative exhibition on rapidly growing Chinese characters licensing related materials.